Middle School is an exciting yet challenging time for young people as they navigate the transition from childhood to adolescence. Here at Friends, we welcome all students by creating a warm, caring environment that allows students to productively explore this unique stage of life in an emotionally and physically safe environment. During this time, we emphasize organization skills, independence, responsibility, and decision making - stressing the importance of participation and involvement in the learning process. At the simplest and most profound level, we teach respect for self, for others, for school, and for the community. Middle School affords students an opportunity to experience very real and varied environments. 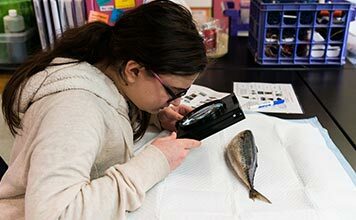 Whether it's oystering in the Lynnhaven River or journeying to the Sea of Cortez, our Middle School students challenge themselves to take risks and embrace the unexpected.